Medical waste management is a concern of healthcare facilities all over the world; about 10-20% of the facility’s budget every year is spent on waste disposal. According to the WHO, about 85% of the total amount of generated waste is non hazardous but the remaining 15% is considered infectious, toxic or radioactive. While non-hazardous medical waste poses less problems, the risks and challenges of hazardous medical waste management must be considered carefully, since incineration or open burning of hazardous medical waste can result in emissions of dangerous pollutants such as dioxins and furans. For this reason, measures must be taken to ensure safe disposal of hazardous medical waste waste in order to prevent negative impact on the environment or biological hazards, especially in developing countries. Biologically hazardous waste can be a source of infection due to the harmful microorganisms it contains; the most exposed are hospital patients, hospital staff, health workers. However, the situation is potentially harmful for the general public as well. The risks include chemical burns, air pollution, radiation burns and toxic exposure to harmful pharmaceutical products and substances, such as mercury or dioxins, especially during the process of waste incineration. 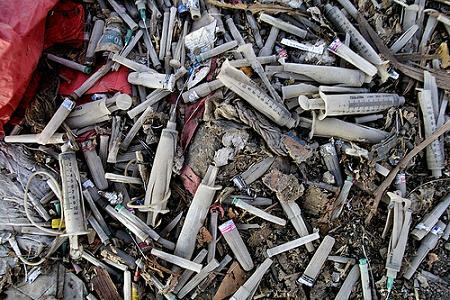 Other risks can also derive from the incorrect disposal of needles and syringes; worldwide, it is estimated that, every year, about 16 billion infections are administered. Unfortunately, not all needles are safely eliminated, creating risk of infection but also the possibility of unintentional reuse. Even though this risk has decreased in recent years, unsafe infections are still responsible for many new cases of HIV, hepatitis B and hepatitis C.
Incorrect disposal of untreated healthcare waste can contaminate drinking and ground water in landfill, and also release dangerous chemical substances in the environment. Deficient waste incineration can also release hazardous pollutants in the air, and generate dioxins and furans, substances which have been linked to cancer and other adverse health conditions. Heavy metals, if incinerated, can lead to the diffusion of toxic metals in the environment. There is still a long way to go in order to ensure safe disposal of hazardous healthcare waste. A joint WHO/UNICEF assessment conducted in 2015 found that only 58% of analyzed facilities over 24 countries had appropriate medical waste disposal systems in place. In the workplace, it is important to raise awareness and promote self-practices. Training in the areas of infection control and clinical waste management is important in order to maintain a clean, safe environment for patients and staff alike. Specialized industrial cleaning can also be effective in reducing risk of infection. It is also essential to develop safe methods and technologies of treating hazardous medical waste, as opposed to waste incineration, which has already been shown to be ineffective and dangerous. Alternatives to incineration, such as microwaving or autoclaving, greatly reduce the release of hazardous emissions. Finally, developing global strategies and systems to improve healthcare waste segregation is another essential step; since only about 15% of clinical waste is hazardous, treatment and disposal costs could be reduced significantly with proper segregation practices. Furthermore, these practices also reduce risks of infections for those workers who handle clinical waste. Tagged Clinical Waste Management, Clinical Wastes, Dioxins, environment, Hazardous Medical Waste, Hazardous Medical Waste Management, Health, Healthcare Waste, Incineration, Infections, Medical Waste Disposal, Mercury, Needles, Syringes. Bookmark the permalink.